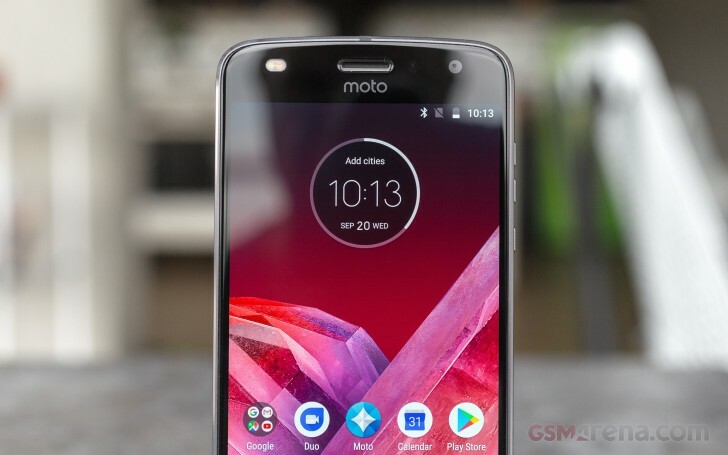 The Moto Z2 Play might share a screen diagonal with its more-expensive Z2 Force sibling, but this is where the similarities end in the display department. The two clearly employ very different panels, but thankfully both of our favorite OLED variety. Mid-rangers that punch above traditional LCD constraints are always a pleasant sight. The Super AMOLED branding suggest Motorola did some shopping over at Samsung's for the particular panel. While some might miss the QHD resolution, we think FullHD still looks perfectly sharp across a screen with a 5.5-inch diagonal. Plus, lower resolution typically means better graphics performance and improved power efficiency. These traits fit in perfectly with the efficient Snapdragon 626 chipset in the Z2 Play as well. But more on that in a little bit. As far as numbers are concerned, the Moto Z2 Play managed a solid 432 nit max brightness in our tests. This is noticeably brighter than the Z2 Force in normal lighting conditions, but also far from what the Z2 Force can output in auto overdrive mode when bright light is available (559nits). This appears to be one significant difference between the pair of panels, or perhaps their respective controllers - the Z2 Play never actually managed to shine brighter than 432 nits. It does have a light sensor and a properly functioning one, judging by its readings. Auto brightness also works as expected. It is just that there is no overdrive mode. Even so, these numbers constitute an improvement over the original Moto Z Play. We also had no real trouble using the Z2 Play outdoors, thanks to its very impressive 4.459 sunlight legibility rating. In terms of color reproduction, Motorola's clearly worked towards a vibrant "OLED"-ish color palette more than anything else. The Z2 Play comes with two color modes - standard and vibrant, neither of which is really calibrated against sRGB. In our test with a colorimeter at max brightness, both exhibited an average deltaE of about 4.8 and a maximum of about 10. Setting the panel to 200 nits doesn't improve things notably. Since the Z2 Play doesn't offer any manual color correction, you are pretty much stuck with a consistent color deviation and especially punchy reds no matter what you do. That being the case, vivid mode seems to be the best choice, since it at least boosts the other colors and brings them closer to the hot, fiery reds. Just like its sibling, the Moto Z2 Play is available with either one or two SIM slots. There are of the smallest Nano-SIM variety and we are happy to report, Motorola found a way around using a hybrid slot for the microSD. Instead, it is positioned on the back side of the same tray - impressive, for such a slim phone. Naturally, mid-range internals necessitate a few downgrades from the impressive connectivity load-out of the Z2 Force flagship. Still, most of these cutbacks are not really deal-breakers for most users. The X9 LTE modem is still capable of a respectable 300 Mbps down stream and 150 Mbps up. The X9 chip also offers decent network band support, including HSDPA 850 / 900 / 1900 / 2100 and LTE 1(2100), 3(1800), 5(850), 7(2600), 8(900), 19(800), 20(800), 28(700), 38(2600), 40(2300), 41(2500). 2x20 MHz carrier aggregation is a nice little touch as well. On the local side, the Moto Z2 Play has Wi-Fi a/b/g/n (2.4GHz) + ac (5GHz). It's a 1x1 configuration, but you do still get 802.11ac Wave 2. Bluetooth is fairly modern as well - v.4.2 (A2DP, EDR, LE). A-GPS, Wi-Fi Direct, Android Beam, and NFC with support for tap-to-pay services are also on board. The Moto Z2 Play also offers the good old 3.5mm audio jack, putting to shame the Z2 Force as it not only is thinner but it also has a bigger battery and an FM radio receiver. The audio jack is positioned on the bottom, right next to the fast USB 3.1, Type-C port. The latter offers USB On-The-Go support. In its second iteration, the Moto Z Play model comes with a drastically slimmed-down 6mm profile. We can't really blame Motorola for the design choice, since slapping a Moto Mod on top of the 7mm thick original Moto Z Play does make for a very bulky package. A new fancy waistline, however, means a reduced battery capacity - by as much as 500 mAh to be specific. While still better than the 2,730 mAh capacity by the Z2 Force, the Z2 Play's 3,000mAh battery capacity is still a notable downgrade. Just like its predecessor, the Z2 Play uses an efficient 14nm Qualcomm mid-range chipset. This time around, it is even the improved and tweaked Snapdragon 626. Throw in the frugal Super AMOLED panel and you've got yourself a promising start. While you don't exactly end up with the 100 hours of endurance of the original, you still get a respectable 76 hour score. This is surprisingly similar to what the Moto Z2 Force manages with its smaller, 2730 mAh battery. The Z2 Force did handle its standby cycle a little better for a few extra hours of endurance. On the other hand, the Z2 Play seems to last significantly longer in calls. Web browsing and video playback on both models fall in line neatly. Both do very well as media players over extended periods of time too. Put into perspective, these are really solid numbers on today's smartphone scene. Furthermore, you can easily slap on a Moto Mod battery pack to conveniently extend the battery life even further. In terms of charging, Moto includes one of its TurboPower adapters in the box. Rated at 5V@3A, 9V@1.6A, and 12V@1.2A, the charger pumps out a maximum of 15W of power. In 30 minutes it charges the phone's battery from 0 to 74%, which is even more than the promised 50%.